Last week, we talked about the importance of posting fresh content and the influential effect it can have on your brand’s search engine optimization efforts. Now that you know why posting fresh content to your digital assets is important, the question becomes, how do you go about doing it? There are several simple ways to keep your digital content fresh that will ultimately pay off when it comes down to where your website and social media pages fall in a search engine ranking. Keeping your digital content current can not only help you in terms of SEO, but it also shows your followers (a.k.a., potential customers) that you care enough about your brand that you are willing to invest the time to post relevant, informative and/or entertaining content for their sake. 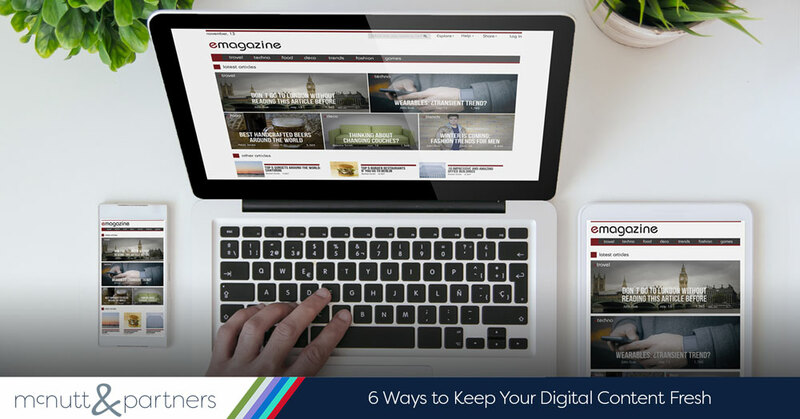 Consider these six ways to keep your digital content fresh. Maintain a regular blog. Posting new blogs to your website on a daily, multiple times a week or weekly basis is a straightforward way to show search engines (and site visitors) that you are keeping your content fresh. Search engines crawl websites regularly looking for fresh content as part of their ranking algorithm, so a blog is a simple platform on which this content can exist. Getting into the routine of blog posting on a regular basis is key, rather than inconsistently posting every now and then. Content should also be relevant and engaging—not just content for the sake of posting content. Update content on your web pages. Another way to keep your digital content fresh is to regularly update the content on your website pages. In this instance, the amount of change on your webpage makes a difference. For example, your freshness ranking will be higher if you update an entire block of copy, rather than just a single sentence. The frequency of change also makes a difference. A webpage with more frequent changes will score higher in freshness than a page with less frequent changes. In addition, focus on core content, rather than boilerplate material. Again, update content on a regular basis in a manner that will actually benefit users—do not just update it for the sake of updating it. Add new pages to your website. Along with updating existing pages, you can also add new pages to your website to increase your freshness score. Websites that add new pages at a higher rate generally score higher than ones that add pages less frequently. This does not mean you should add new pages every week, or even every month (especially if you are using other ways to keep your digital content fresh); however, adding new pages a few times a year can help. In essence, maintaining a blog is a form of adding new pages to your website. Increase new links to your site. Finding ways to increase the number of external sites that are linking to your website is another way to show that you are keeping your digital content fresh. A steady increase of new links over time will benefit you more than inconsistent link growth. Search engines often view an increase in new links as a sign of relevance for your website. Be wary, however. Extremely rapid link growth can be indicative of spam, which search engines will penalize you for. Link to other sites with fresh content. If your site links to other sites deemed “fresh” by search engines, it can in turn help your freshness score. The idea also works the other way around. If your site is linking to inactive pages, then this can count against you. Make sure links on your site are going to pages that are kept current, and seek opportunities for fresh sites to provide links to your site on their pages. Work to increase user time spent on your site. The quality of content on your site will affect your click rate and how much time people are spending there. The more clicks you have and the longer time users are spending on your website, the more it will indicate to search engines that your site is fresher than its competitors. Click-through rate itself may not necessarily be a contributing factor to the freshness algorithm, but it does show search engines that there is interest in your page. Using these ways to keep your digital content fresh will present your site as relevant and well-received in the eyes of both search engines and potential followers of your brand. If you are worried about having enough time to stay on top of new content generation and distribution, the McNutt & Partners team can help. Give us a call today at 334-521-1010 or visit our contact page.